Batavia Body Company was founded in 1852 as the Newton Wagon Works. In the 1920s the company was merged into the Emerson-Brantingham Company that produced a complete line of farm implements and associated equipment and was listed on the New York Stock Exchange. During the depression, Emerson-Brantingham ran into difficulties. A number of Fox Valley residents who were stockholders arranged for the separation of the local company from Emerson. Established as an individual entity, the company was given the name Batavia Body Company in 1937. During this same time, the company became engaged in the building of wagons used for the hauling of milk. They were cooled by cake ice and insulated with cork. 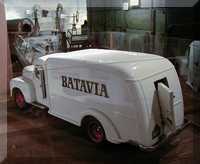 In the 1930s, Batavia applied new developments of mechanical refrigeration to the first building of a compressor cooled milk transporting vehicle. 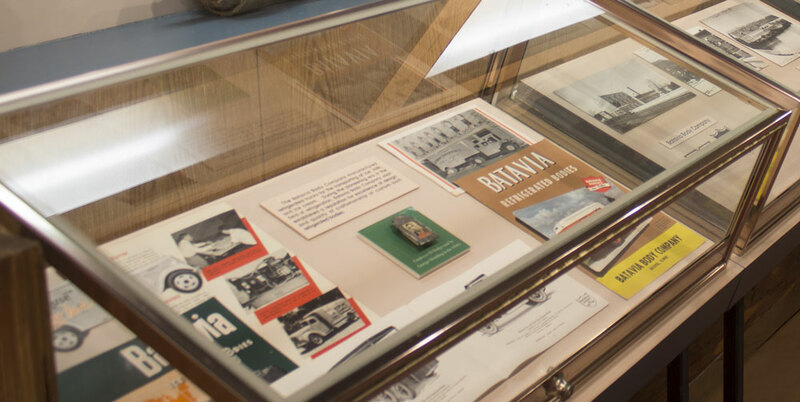 This established Batavia as a leader in a new and rapidly expanding field-refrigerated truck bodies. By the 1960s, insulated and refrigerated equipment was the only product manufactured by the factory located in downtown Batavia. Among the company’s customers were Dean Food Company, the Borden Company, Bresler Ice Cream, and Ekrich Meats. In 1955, the company was purchased by the American Gage and Machine Company of Elgin and continued manufacturing refrigerated truck bodies. Batavia Body Company ceased operations on June 29, 1973. The buildings were razed to make room for a strip mall.